Melina Marchetta can never disappoint me. I would wax poetry about her writing if I could. If you haven’t read any of her stuff, you’re missing out! Tom has had a rough year. He lost his uncle, his family got torn apart right in front of him and he has pushed away his friends and the girl he loves. Now, he’s forced to crash at his aunt Georgie’s home. Georgie also hasn’t had an easy life. She had lost her birth-father to the Vietnam war. Then, a year ago she lost her brother to a bomb-blast. She was left shattered and her ex-boyfriend Sam stepped up to pick up the pieces. Sam broke her heart 7 years ago when she told him to take some time off from their 7-year old relationship and figure out his own life. He took that to mean casually dating (Ross & Rachel, anyone?) and got a woman pregnant. Yiikes. She never forgave him but she didn’t force her friends to pick a side. So, they still ran in the same circles. Now, she’s pregnant at 42. With a guy she still hasn’t forgiven . This might all sound depressing and these relationships might seem dysfunctional but far from it. There’s so much love between these characters. They are all broken and looking to heal. My favorite part about the book was Georgie and Sam’s relationship. The way she feels so ashamed about letting in the man who broke her heart. She feels guilty about being happy with the pregnancy, because it came at the cost of her brother’s death. Then there’s Sam who spent the last 7 years with the knowledge that he lost the love of his life but he could never wholeheartedly regret because he could never regret his son Callum. FYI, Callum is the cutest kid! I loved him. And I loved seeing the whole equation between him and Georgie. I loved Dom and Jacinta. I loved how he dropped out of law school when she got pregnant with Tom so that she could finish her own law degree. I loved how she didn’t leave him for good. She called it tough love and told him to fix himself so that she could come back. I love how after he started recovering, they’d send each other love letters. I loved the cozy little circle Georgie, Sam and Dom had. How, everyone lived near each other and the community was tight-knit. Lucy, Abe, Bernadette, Stani and Jonesy. They were all minor characters but still had their own characteristics and roles in their friends circle. I loved the political discussions these people had and although they disagreed and argued, their friendship did not waver. How real! I loved Tom and Tara. He blew her off after what she calls a “One and a half night stand” because his uncle died right after. She told her friends who told everyone that he broke her heart .He spends the whole book wooing her back through calls and texts because she’s in Timor now. I loved how he is forced to work with his friends at a hotel and although he is a jerk to them at first, slowly he mends his fences with them. In fact, this book is all about mending fences and healing. Melina has an amazing way of writing family dynamics and writing it in a real way. The relationships she writes don’t ever feel far-fetched or forced. The way she can insert humor in the regularity of moments between families and friends? That’s purely brilliant. Her stories are driven by characters and their relationships. 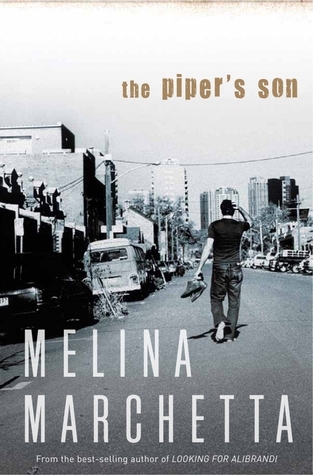 The Piper’s Son is no exception. By the end of the book, I was left with a longing for an entire book about the start of Dom and Jacinda with Sam and Georgie’s story. This book made me cry and laugh and just feel grateful for my people. I couldn’t recommend this book enough to people who love stories that feel real. Stories about families and friendships.